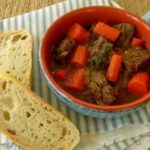 A hearty French dish made with beef, carrots, onions, wine, broth, and herbs. It is a delicious, slow-simmered meal you will want to make again and again. In a large dutch oven or similar heavy pot, heat the butter and oil on medium-high heat. Sprinkle the beef with 1 teaspoon salt and 1/2 teaspoon pepper. Cook the beef, in batches, until browned on all sides. Transfer the browned beef to a plate and set aside. Reduce the heat to medium, add the onions to the pot, and cook on until translucent. Add the wine and stir using a wooden spoon to scrape off any bits on the bottom of the pot. Add the beef, stock, 1 teaspoon salt, 1/2 teaspoon pepper, thyme, and bay leaves to the pot. (The herbs can be tied into a bouquet garni for easy removal when done). Stir and bring the mixture to a boil. Cover the pot and reduce the heat to low. Simmer for 2 hours. Stir in the carrots, cover the pot, and simmer for an additional hour. Discard the bay leaves and thyme stems (or bouguet garni). Serve with French bread.